While developments in brake technology in the past have been slow and gradual, the sector is experiencing something of a revolutionary change due to the trends of electrification and autonomous driving. But what does the future hold. 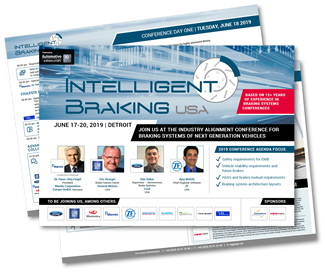 Expand your knowledge within this area, with this exclusive free report written by Automotive IQ on the topic: "Regenerative Braking in an Electrified/Autonomous Landscape". In an automotive world brimming with tech developments, the benefits of drive-by-wire for end consumers are out in the open. Projections show that this technology will grow at a compound rate of 8.86% between 2018 and 2025, nearly doubling its market size from USD19.12 to USD34.63 billion during the same period. But, drive-by-wire technology faces an uphill road due to high costs, risk of electronics failure, and different drive feel. So, despite the healthy business predictions, how can the industry overcome such barriers and finally reach the much needed consumer adoption to live up to growth expectations? So, if drive-by-wire systems offer so many benefits, what is there to overcome? Expand your knowledge within this area, with this exclusive free report written by Automotive IQ on the topic: "Drive-by-Wire: How to Overcome the Barriers to Consumer Adoption".